IHeart Organizing: Chatting with a Professional: What Would You Ask? 94 Chatting with a Professional: What Would You Ask? I am so excited that later this week I get to interview a Professional Organizer. It's actually something that has been on my wish list of things to do for awhile. Of course, the sweet part is that I get to share the interview with you. So that got me thinking. What would you want to know? If you could ask a Professional Organizer any one question, what would it be? Anything from getting started as a professional to common organizing dilemmas, feel free to throw it out there! I can't wait to see what your inquiring minds want to know! Please comment by eod Wednesday, 2/15. This is amazing! I'd like to know how you teach small children how to be be/stay organized. Congrats on the interview! I'd love to know how a professional would tackle organizing a small space that needs to function as many different things, like a living room that's also the home office, family room, and where all the reading and tv watching happens. same! we're a military family in Germany and the rooms are SMALL. My living room is also a play room and office AND since we dont have room for a table we have to eat around the coffee table. I would ask what advice a professional organizer has for an aspiring professional organizer. Are certain certifications or organizations worth while or particularly helpful? (Alternatively, you could ask how this personal organizer got his or her start in the business. Looking forward to it! this is my question(s) as well! would love to know this, too! What is your "Golden Rule" for organizing and avoiding clutter (i.e. Fly girl says to start with a clean sink... my mom says to have a basket on the stairs to collect things to take up and down). How can one find a professional organizer in their specific area and what tips do you have for interviewing/choosing someone? Keeping the kitchen tidy and how to encourage the whole family to stay involved in organizing (husband and two small children). I am always on the lookout for great tips on organizing a small room that has to function as home office, craft room, home business center, and decor storage all in one! I'm looking forward to the interview, but I just wanted to say, you know, you're a professional organizer too! You organize and write about it for a living, no? Sometimes it takes things like that a little while to sink in! Since hiring a professional organizer would be a splurge for most people, how do you justify your rates? I think a lot of people would LOVE to hire someone, but the cost prohibits them. Are there different levels/rates of charging for certain services that make it more appealing, affordable, etc? "Getting fully organizing is an exciting challenge, but quite possibly the hardest part is STAYING organized and keeping clutter at bay -- what is your favorite tool or product that keeps clutter at bay long after the organizing makeover took place?" aka how do I stop being my own worst enemy by messing up a good thing with clutter? =) haha! can't wait for the interview dahhling! I live in NYC, and so of course I don't have much storage space. What are some good ideas for a tiny storage space that has to be multi-purposed?? I have 2 tiny closets that have to hold all 4 seasons of clothing as well as store decorations, paperwork, sewing machine, air conditioner, luggage, etc. and it gets overwhelming!! I'd love to read the Professional Organizer's thoughts on organizing kids' closets! That's a really good one!! My boys share a room and closet already and the closet is just not working for us! I would love to hear a few ideas on organizing the growing collection of childrens toys. My son has lots of BIG trucks and the big toy tub is not containing them anymore! Jen, the only difference between you and a professional organizer, is that I guess you haven't paid the $200+ to NAPO. You are about as good as they get!!! I feel like I have a pretty good handle on most things, but my kids clothes is my biggest stress point. We live in a seasonal climate so we have lots of clothes. I have no problem passing along toys, but I always feel emotional about clothes. I would love any tips in that area. My questions would be as I saw above- how do you teach children to be organized growing up. I also would like to know how they store things that are seasonal- clothes, decorations etc without it being stuffed somewhere and being forgotten about? I would ask for suggestions on where to begin when organizing small spaces. Sometimes spaces aren't big enough for containers or extra shelving, etc. That would be like my absolute dream job so I wonder what steps they had to take to become a professional organizer and gain some credit for it! I am pretty good at organizing, but there is one area that I just can't manage and that is children's books. I have tried so many different ways to organize my daughter's books. I would like to know what recommendations they would have to help me. Thanks for asking our opinion! I thought you were a professional organizer. If not you should be. My question: What resources (trade magazines, blogs, etc.) do you review on a regular basis? My biggest problem is keeping my bedroom organized and tidy throughout the week. When I try to organize and tidy up my room it only lasts for a day or two and then I am back to the mess I have made. Most of my clutter consists of clothing, purses, books, little things I can't seem to get rid of and cosmetics. What long lasting advice would you give me as far as organizing my bedroom and how to keep it organized throughout the week. I don't have a lot of money to spend on organizing boxes, etc so any penny pitcher advice would help. What is your favorite resource for very small spaces? How can you keep a space from reverting back to the way it was? Can you organize an entire home with what the average home has on hand (meaning absolutely no money spent at the store), and if so, tell/show me how? What organizing item/tool can you NOT live without? As someone who is really just starting out at getting and staying organized, I want to know where to start! It feels like a really overwhelming task and it is not something that comes naturally to me! I would ask: What is your advice for a military family who is constantly moving from place to place to get organized before, during and after a move. Cannot wait to read the interview so exciting. I would ask how can one manage to keep the house organized and functional for the whole family specially when you have two little kids without loosing your mind. OO Jen this is great! I would ask how do you work with a house(rooms) that just doesn't seem to flow right? How do figure out toys toys and homeschooling supplies? I feel like I am always moving those things around looking for the perfect space..
How do you organize a space (ie: kitchen) when spouse a) has no interest or b)keeps bringing things duplicate, unnecessary things in? We are both (yikes) hoarders. I struggle with my own stuff but the kitchen is where we cross paths. I know how to organie, it just never stays that way. How did you get your first paying job and how did you feel when it was finished? I would love to get started, but just am not sure how to get that first job. Thanks! What is the biggest mistake people make when organizing? What is the biggest misconception about it? As someone who is trying to get started as a professional organiser I would want to know how, as a professional organiser, you overcome the mental block people seem to have about hiring one. There seems to be this shame to getting help; people feel like they should be able to be in control of their own home and shouldn't need help; they don't want a stranger to come in and see their mess. How do you go about marketing your business that overcomes this? And how do you get people to "get" that you're not just coming in and tidying up for them, but establishing systems that make sense to them and teaching them skills that will help them to stay organised? When tackling a large organizing project do you suggest someone chart a course of action/timeline. Umm... this post made me chuckle a lil' bit. Jen, in my book you are a professional organizer. I think you inspire thousands of women to take on organizing projects big and small every day. But, it is very cool that you are stoked to interview a professional. Have fun! What is your advice on how to STAY organized? I'm great at getting organized initially, but I have a hard time keeping things that way. How did you get started offering your services? How much do you typically charge - by the hour or by the project? How do you keep things like shoes, coats and hats from becoming a piled mess on the floor? Our coat closet is half-way across the house from where we enter/exit. I seem to be the only one willing to walk to the closet and put stuff away. I guess the bigger question is: How do you get your family on board with putting things away if it's become a habit not to? Two things: What is her suggestion when working with people who do not give things up. and Two, what is her most horrifying turned most rewarding project story! ahem, not all of us can have an actual mudroom, or even real laundry room or entryway. Now where do shoes and backpacks go? I'd be interested to hear how your professional oraniser has made the transition from being an interested in organising and at-home organiser to becoming a professional. Also what was it that motivated them and gave them the confidence to feel that they had a service to offer that was above and beyond what people could achieve by themselves at home and believe they could charge for that service and make a living in that way. Also, Jen it seems like you are/feel like you are in the transition process from the at-home organiser to the professional (even though I'm with other reader who say you're already there! ), so I'd really like to know your thoughts/opinions on this too. And carrying on that train of thought, what advice can you offer someone thinking about taking that leap of faith to professional organising themselves? Thanks for letting us be included in your interview! My question is "What is the best tip you can give for keeping on top of paper clutter (mail, school papers, etc.)?" I've tried so many things and it seems like my counters & kitchen desk are still always covered with piles and piles of paper! This is my question too. And add to that electronic plug ins (phone, iPad) and store receipts and coupons. You know what I do? - Every year I start up one of those plastic expanding folder things with 12 months and keep it in my desk drawer - EVERY "important" piece of paper goes in there by month ( credit card statements, bank statements, etc) - junk mail gets tossed immediately and I keep my receipts in the smaller versions of the same folders. I am curious what the best way to organize a child's play kitchen is. The play kitchen we have has NO storage in it, and my kids have SO much play food, dishes, cups, cutlery. I have no idea what to do with it all. I had a rule that if it fit in the little tikes shopping cartmit stayed. If it didn't fit, we had too much. They loves the cart as much as the kitchen. It was great storage!!! I love love love the oxo containers - They are sold at Macy's, Bed Bath & Beyond (hello 20% off) and Target! My hubby and I both have a problem with paper. Our office is the worst place in the whole house! What's the best way to handle papers? How do you know which papers are important to keep, not to keep? How do I encourage my kids to help with the house work and still keep things I organize neat? What is the first step in turning your passion to organize into an actual business? What is the best way to store shoes? I have about 60 pairs and I need an effective way to store them. Help! What is your weakness in organizing your own living space? What do you find a challenge despite your profession. My question would be related to organising with a budget in mind - what products/tools/storage ideas are worth investing in versus which ones would you make yourself, or use what you already have? I always think my life would be so much better organised if I had an unlimited budget, but knowing what to scrimp on and what to splurge on would be great! My question would be "where do you START?" "this (insert adorable organization thing-a-majig here) is so cute .. what do I *NEED* it for" or "Where would I put this / HOW would I use this"
How to inspire my disorganized husband, I work outside the house and he is here all day. I spend most weekends organizing only for it to be undone. help! Rather than nagging them to do things, I try and create systems that encourage them to be tidier and more organised. I've found this works better as Hubs sees (even if it takes a while) that the system I put in place makes his life easier and its better for him to follow the system than fight against it. Just found your blog! Best discovery!! I love it and I am going to thoroughly enjoy reading about how to organize my life... I need it! How about...the best tip on keeping clothes organized. I always find that once the laundry is done and clothes are put away, they're scattered all over the floor by the end of the week. It seems like it should be the easiest thing to keep organized, but it's the most difficult for us! I'd like to know really what criteria professional organizers use for cleaning out and sorting through clothes in our closet. I have a hard time getting rid of clothes that I haven't worn in a long time. I know I need to but I'm always worried to get rid of clothes. Just curious what organizers use as guidelines. How to get motivated to even start. "Have you ever gone to a client's home and drawn a blank or balked? What was the situation and what did you do in response?" I'd also like to learn how to organize for someone else. What works for me might not work for them, so tips on recognizing patterns in their messes and solutions that suit their problems would be helpful. I am not a professional organizer, but I am the office manager for one. If you ever want to learn a System to use for organizing any project, you should look at her website. It's called Clear & SIMPLE, LLC. Her website is clearsimple.com and her systems of SEE IT, MAP IT, DO IT and S.T.A.C.K.S. are amazing. Just thought I'd pass it along! How to keep lego under control? 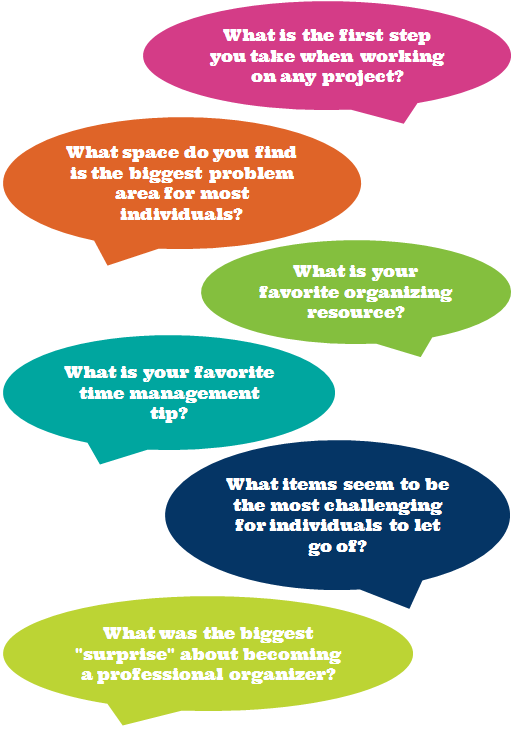 How do you best tackle a room full of clutter when just walking into the space makes you feel overwhelmed and deflated? Also, we feel like we are drowning in papers, even with getting ebills for as many things as possible! What do we really need to keep?? I worry about throwing away something that might be important down the road, so I feel like I should hold onto a lot of it, but should I be? What is the one thing/place we should make sure to keep organized? If only one thing could be organized in your house, what would it be? Where should I start? What is the most important thing to keep organized first in the home? what is your ONE favorite organizing product of all time? When we organize things, we find that the best way to maintain our new system is to design it around the way we naturally function. For example, we set up our closet, laundry, and shower all near each other so that it's very easy to put away clothes immediately, have fresh clothes laid out when we shower, and toss dirty laundry right where it belongs in the morning. We also found that it's easier to keep our kitchen clean when we eat at the kitchen table, bc we get right up & wash the dishes instead of watching tv, etc. We love these routines, but both ideas were just "lightbulb" moments that happened by chance. Is there a system or thought process for organizing that could help us find that natural, easily maintained solution for other areas? How do you build routines that work for your personality so they stick? Can't wait for the interview post!! You're AWESOME!! How do you make time to organize? I love to organize, but what keeps me from it is the time commitment rather than not knowing what to do. Any tips on how to make time here and there? For example - a project that can be done while my toddlers are eating? Thanks! Have you ever run into any controversial organizing tip(s) that professionals cannot seem to agree on? Have you encountered any strange stereotypes about Professional organizers? I'd love to know how to start organizing and keep a space organized when others in the household are not on board with any decluttering or organizing at all. I feel like I'm trying to swim upstream in my efforts! What is the difference between tidy and organised? A lot of blogs I read seem to just be people tidying things up - that to me isn't organization, what do you think? I know I missed your deadline, but thought you may have some ideas of your own. My question is what kind of storage, found in common areas of the home not their rooms, for kids toys is practical and will take you through the years? My 2 boys are 6 and 8. They have lots of dinosaurs, legos, stuff that fits in bins quite well now. But as they grow, I don't see them needing bins for that kind of stuff anymore...maybe? Not sure. I LOVE the Ikea bookcases that fit the colored plastic bins (they each have a bookcase in their room for books and toys etc) and was thinking of putting one in the basement to get some stuff out of their room as they are small rooms. I hate to invest in that kind of storage unit if it can only be used in that way a few more years. I can maybe see putting some more decorative items on the shelves or books, but to have such a large shelving unit....is it practical? As I said I know I missed the deadline to ask the pro, but in my eyes you are also a pro, and you may have already started thinking about that too!